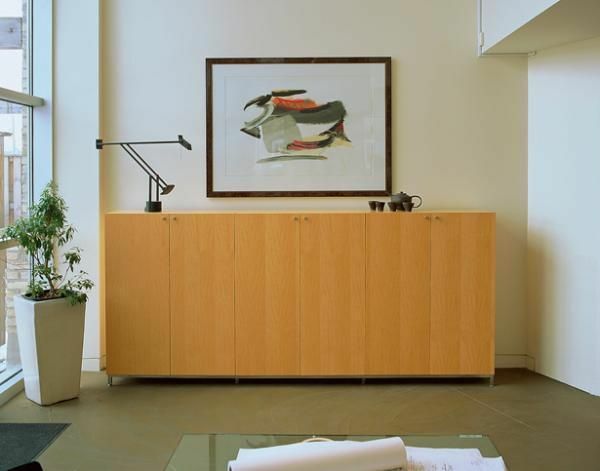 The credenza became popular during the post war building boom. It became a modern version of the sideboard when it was used primarily for serving food. Over the years the credenza has evolved being used for a variety of storage purposes for anything that the user can imagine. It is said that credenzas are the one piece of furniture everyone needs. For instance, in open concept homes credenzas can become room dividers between a dining room and living room serving different functions on opposite sides of the cabinet. Other uses include storage for a home office, console for a flat screen TV, desk and an entertainment cabinet etc. A credenza's interior spaces and size can be can be shaped by the needs and requirements of its user. This storage unit was designed specifically for a client who required large deep shelves for design and portfolio books. We can also produce the unit with interior shelving suitable for stereo equipment, making the unit ideal as a base for an entertainment center beneath a flat screen television. It demonstrates Eidos' conviction that practical furnishings need not be utilitarian, but can exhibit beauty of form and design. This unit is made of maple with slip matched veneer on the doors producing contrasting vertical lines. Size: 72" x 24" x 30"
Dimensions: 38" x 96" x 18"